ItemB-07256 - "Granville Street Bridge, Vancouver, BC." ItemB-08292 - Children going to school by horseback, Westwold. ItemB-08301 - A fleet of White Line tour buses. ItemB-08302 - C & C Transportation Co. Ltd. bus in front of the BC legislature. ItemB-08304 - Torpedo shop, HMCS Naden, Esquimalt. ItemB-08309 - Telegraph Creek Post Office. 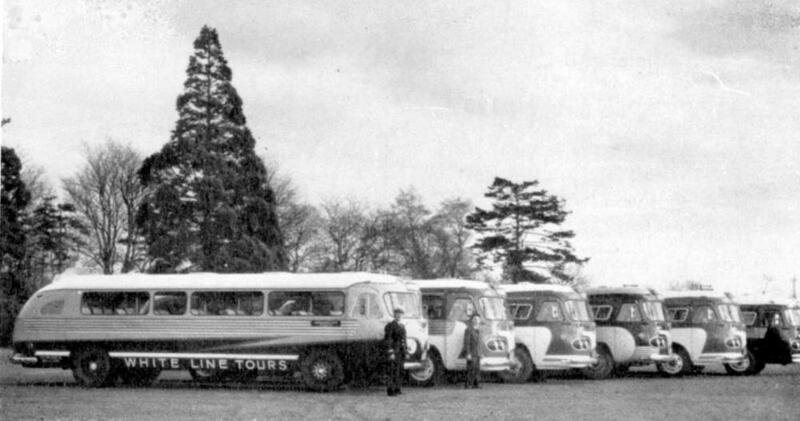 Item B-08301 - A fleet of White Line tour buses.